Effective self motivation techniques are essential to keep us all on the path to success. Achieving a complex goal requires hard work and focus over a long period of time, and that's not fun. We need to set ourselves up for success for those moments when our motivation is at a low. In the series on mastering the skills that will move your craft business forward, we've looked at debunking old beliefs about talent and understanding how to practice to develop complex skills. Once you realize that developing a key skill is a matter of working smart and hard, and you decide you're willing and able to make that commitment, it will be essential to develop some self motivation techniques to keep yourself committed to moving forward. Developing a new, complex skill is achievable, but you have to be willing and able to commit to plenty of tough practice. Motivation is key to doing the hard work. You can achieve a big goal, but you have to do work that is difficult and not fun. There's no doubt, there will be times when you want to quit. In those moments when your motivation is low, your reasons to continue have to outweigh your reasons to stop. Ultimately, you need to keep going when you don't want to and be willing to do more than others are wiling to do. Research laid out by Angela Duckworth in Grit, and Anders Ericsson and Robert Pool in Peak shows us that talent is overrated, and smart, hard work consistently wins out over inborn talent. 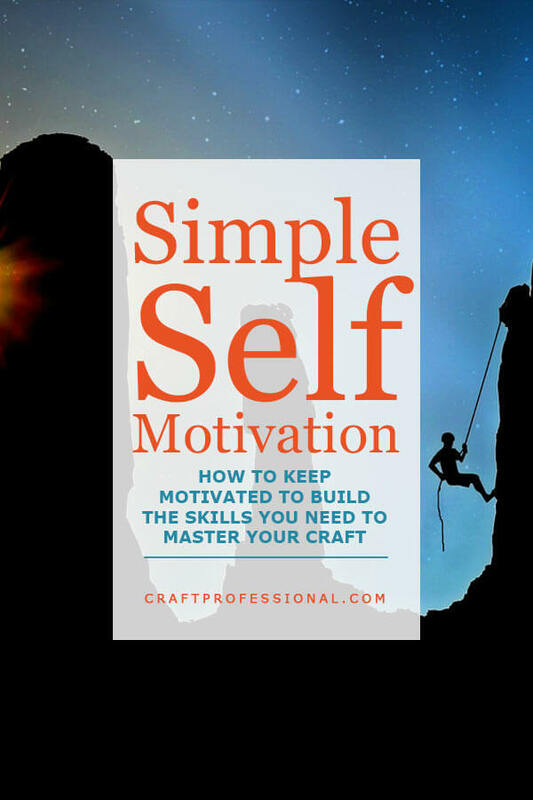 That way of thinking about building skills may be a major shift for you, but it's important to internalize the concept if you want to be able to really commit to mastering a challenging skill and maintain the motivation you'll need to keep pushing forward. If you can't shake the idea that inborn talent is essential to success, and you don't believe you're gifted with talent in the area you want to master, you'll have trouble believing that smart, hard work will lead to success. The idea of talent, and genius is dangerous. It allows us to talk ourselves out of hard work. It gives us an out to avoid work we don't feel like doing. If we believe someone's skill is the result of raw, inborn talent (and not hard work), we won't believe that working hard will allow us to accomplish the same degree of skill. If we think you have to be born with talent - if we don't believe at our core that we can develop skill with the right kind of practice - then we will never commit to doing the tough work required to achieve any worthwhile objective. Why would anyone commit to long hours of challenging work if they didn't believe at their core that it would lead to success? Happily, there are several proven self motivation techniques and strategies you can put in place, ideally when your motivation is high, to keep you going when you're tempted to quit. Here are 9 ways to strengthen your reasons to continue and weaken your reasons to quit. We've already looked at this factor, but it's crucial and worth repeating. You need to realize that skill development is not about genetically inherited characteristics; it's about committing to doing a lot of the right kind of practice. If you think you can't you won't. A teacher can provide meaningful feedback that is crucial in making progress and maintaining motivation. Teachers can help you progress faster and guide you through road blocks and challenges that can cause motivation to flag. They also provide an excellent source of accountability and social support. In the development of any skill, there will be natural ebbs and flows in your progress. It is quite natural for improvement to slow down at some point in your development. That doesn't mean you've hit your peak ability; it generally means you've hit a road block that's impeding your progress, and you need to figure out what aspect of your performance is holding you back and then figure out how to improve. You must create habits and routines that support your goal. The more something becomes a habitual part of each day, the greater the chance you will do it. Determine the daily actions that will be required to build your skill, and then turn them into habits. If you're going to build a challenging skill, you must commit to practice on a regular basis, and if you're going to practice every day, you need to put that practice time in your schedule. Make it an unbreakable appointment. If you allow yourself to say you'll just grab the time whenever you have a free moment, you will never get it done. You may practice a bit here and there, but, without a clear schedule, you'll never commit to doing the work that needs to be done. The good news is, you don't need marathons practice sessions to build your skills. An hour is about all people can manage to maintain the degree of focus required to make progress. If you're going to commit to building your skill, find an hour in your day, ideally when you're at your best, and commit that time to mastering your craft. Here's the fun part of mastering a tough skill. Get cosy in your bed, and get some sleep! You concentrate better and make better decisions on better sleep, so stop staring at the glow of your smartphone, and get to bed. You know before you begin that things will conspire against your best plans. Whether it's other work commitments, your health, or your family, something will keep you from executing your plans at some point. Consider the competing demands that are most likely to sideline you from your goals, and before they do, make a plan to stay on track if possible, or quickly get back on track if a break is necessary. Social motivation can be a powerful tool in keeping us motivated. Some days, the only thing that gets me to the gym is the fact that I don't want to explain to my teacher that I was laying in bed when I was supposed to be hard at work on a bike. Sometimes, when I'm writing and the words just don't flow, the thought of disappointing my newsletter subscribers who've come to expect new articles every week, is the motivation I need to keep at it and finish an article that's been especially tough to write. Sometimes we're better at not disappointing others than we are at not disappointing ourselves. Find someone you don't want to disappoint, and build in some social accountability for working on the skill you want to build. Seeing progress helps to reassure that you're on the right path. Sometimes, in the midst of a tough, long term project, we forget how far we've come. Find ways to track your progress for those times when you need extra motivation. If you're developing a craft skill, keep your old work, or at least keep photos of your old work, even the mistakes. At some point you'll be able to look back and see real progress in the quality of work you create. You'll be creating pieces that you previously couldn't have imagined, and that knowledge will help you push forward to develop even more skill to create even more impressive work. Before you even begin to develop a complex skill, be prepared for a lot of work. You've probably heard the idea that it take 10,000 hours of practice to master any task. It turns out, the 10,000 hour rule isn't true. The time it take to master a skill varies from field to field. It may be more. It may be less. It depends on the complexity and competitiveness of the field you want to master. It probably won't be 10,000 hours, but it will be a lot. Successful people aren't magically born that way; they work smart and hard. That's great news. It means we can all pursue the skills that inspire us and work towards success, even if we think we're not gifted. However, we have to be willing to work hard. We have to accept that we'll need to do the things we don't want to do. If we're working effectively to build skills, there will be many times when we're not happy about it in the moment. We need to just get on with it and do what needs to be done, so we can enjoy the fruits of our labor and satisfaction of building a skill that truly speaks to us. I've just scratched the surface of the newest research on learning and skill development in this series of articles. It has truly, fundamentally changed the way I think about building new skills. If it intrigues you as well, I'd suggest your take a look at Grit by Angela Duckworth if you want to understand more about developing the tenacity to stick to things when you want to quit, and Peak by Ericsson and Pool if you want to learn more about the specific strategies you need to use to practice in a way that gets results.